Case Crew rowers Emily Schnittman (s), Ingrid Iversen (3), Sarah Carlson (2), Dani Pezzuto (b) with coxswain Elizabeth Tobin headed south to Gainesville, Georgia for the annual American Collegiate Rowing Association (ACRA) championships on Lake Lanier. Due to impending weather on Saturday afternoon, racing was compressed in the morning into time trials for most events. The result of the time trials fed the semi-finals early (earlier than planned) on Saturday afternoon to beat the weather. The time trial distance was about 1900m; timing started just past the starting plaforms. Click here for full regatta results. Regatta photos can be found here. 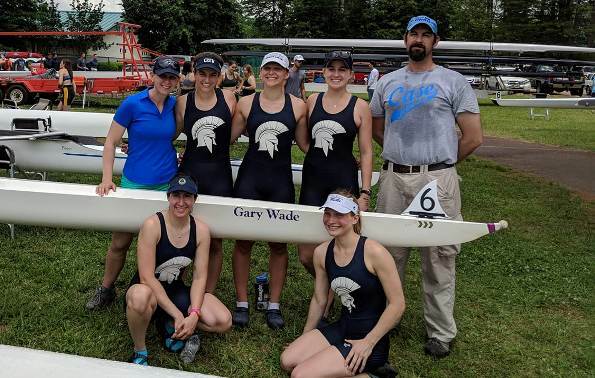 CWRU Women's Varsity 4+ with their coaches Rachel Stanley and Aaron Marcovy.